appears counterclockwise. Time increases from left to right and top to bottom. at C-band (7190 MHz, 4.2 cm) using the 80 kW transmitter on DSS-13. 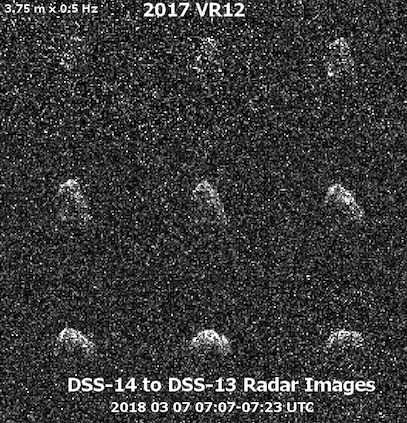 Bistatic DSS-14/DSS-13 Delay-Doppler images of 2017 VR12 obtained on March 7, 2018. Resolution is 3.75 m x 0.5 Hz. These are X-band (8560 MHz, 3.5 cm) images. Bistatic DSS-13/Green Bank Telescope Delay-Doppler images of 2017 VR12 obtained on March 7, 2018.
resolution is 3.75 m x 0.5 Hz. The sequence spans 1.8 hours or about 1.3 rotations by the asteroid. its physical properties except its absolute magnitude of 20.5, which suggests a diameter of about 250 meters. rotation period of 1.4 hours with an amplitude of 0.2 magnitudes. P. Pravec has obtained the same rotation period. M. Devogele reports that spectroscopy obtained at Lowell Observatory indicates that 2017 VR12 is a V-class object. Consequently, we expect a high optical albedo and a high radar circular polarization ratio. using transmissions from DSS-13. Time is scheduled at both facilities during March 5-7. 2017 VR12 will be brighter than 16th magnitude for about four weeks during February and March of 2018.
small telescopes for experienced observers at sites with dark skies. 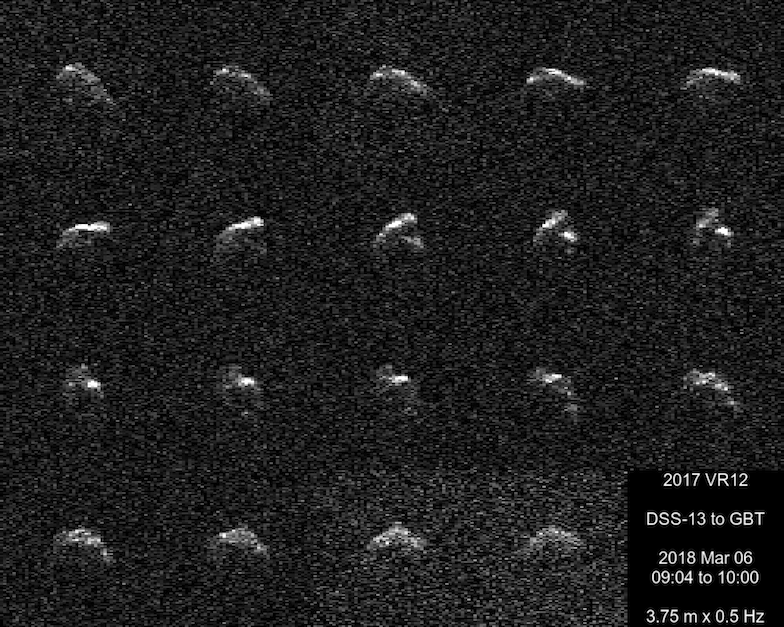 Due to its rapid motion in declination, 2017 VR12 is visible at Arecibo on only two days during March 6 and 7.
to observe this object with radar in Australia. The 2018 encounter is the closest by this asteroid currently known. is actually planned for this object. 2017 VR12 is classified as a "Potentially Hazardous Asteroid" by the Minor Planet Center. spectral class           V           M. Devogele et al., pers. comm. rotation period          1.4 h       T. Lister and J. Chatelain pers. comm. ; Y. Krugly pers. comm., P. Pravec pers. comm. Horizons were set at up to 26 deg on some dates prior to Feb. 27 when the asteroid is circumpolar. The Goldstone DSS-14 monostatic SNRs assume that Ptx = 100 kW. DSS-13 bistatic SNRs assume Ptx = 80 kW. For DSS-14 bistatic SNRs, assume Ptx = 180 kW. stations at Badary and Zelenchukskaya in Russia on March 5. Spectroscopy reported by Devogele (pers. comm.) indicates a V-class (i.e., probably basaltic) composition. V-class NEAs have high optical albedos of ~0.3 - 0.4, so the diameter could be close to 170 meters. V-class NEAs also tend to have radar albedos > 0.2, so the SNRs above don't change significantly. track to save them time for imaging. We can do this on both March 5 and 6.
from DSS-13 to Arecibo. Thus, we will use only part of the Arecibo time for DSS-13/Arecibo 2-meter imaging. On March 6, we plan to transmit from DSS-13 to Arecibo for only part of the Arecibo track. from DSS-13 to Arecibo. We will use only part of the Arecibo time for DSS-13/Arecibo 2-meter imaging. Arecibo imaging (or possibly DSS14/Green Bank 40 MHz imaging). DSS-14 is scheduled to transmit primarily in case something goes wrong with DSS-13. time at Green Bank for observations during those times. earlier there on March 6 and 7 than is shown above. Rise-Transit-Set Times at the ATCA (-47):  Horizons = 20 degrees. There's no overlap between DSS-14 or DSS-13 times actually scheduled and view periods at the ATCA. the bandwidth could be about 18 Hz at DSS-14.